Matrix / Runout (Side A): AG 001 A1 MPO STU. Presence is certainly one of the most gorgeous tracks from the Good Looking stable and the scene as a whole. PHD gives us his masterclass on exactly how the amen break should be used, constantly varying it's pattern throughout each bar and combining it with a beautiful blues led sound. Those who like Source Direct's "Secret Liasons" will absolutely love this and vice versa. Let it be said that PHD is one of most talented D'N'B artists of all time. 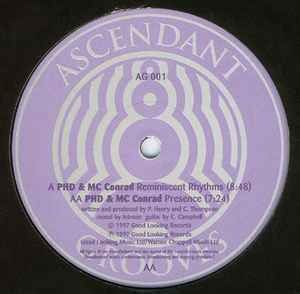 A master of the AMEN, Presence is a classic track that combines a quality AMEN beat formation with a lovely blues bass-lead, courtesy of Chris Campbell. While, Reminscent Rythms builds on warm sweeps and a jazzy saxphone put over a rythm of beats.